New from our friends at Motawi Tileworks! 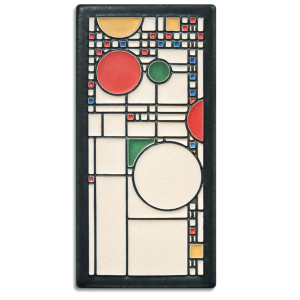 This 4" x 8" tile by Motawi Tileworks was adapted from the work of Frank Lloyd Wright. In 1912, Avery Coonley commissioned Frank Lloyd Wright to design the Avery Coonley Playhouse in Riverside, Illinois as a place for his wife to educate neighborhood children in the Froebel kindergarten method. Wright themed his extensive use of art glass in the Playhouse to appeal to the children.This handsome tile is shown framed in our own handmade quarter sawn white oak frame, hand selected to ensure the best finish, in our flat 2" wide Oak Park profile. Also available in our 3" wide beveled Legacy profile, or unframed. Both frames come in a variety of stain color options - make your selection in the pull-down lists below.